After graduating from Oxford in 2004, I went on to study for a Masters in Hydrogeology at the University of Birmingham. It was during the Christmas vacation of my Masters that an earthquake approximately 9.3 on the Richter scale struck off the west coast of the Indonesian island of Sumatra, triggering a devastating tsunami. Following the news coverage, I could see how the skills that I was developing could be essential to the redevelopment of the areas affected and just wanted to go and help. Little did I know that two years later my employer, Mott MacDonald, would post me to Aceh, the worst hit region of Sumatra. 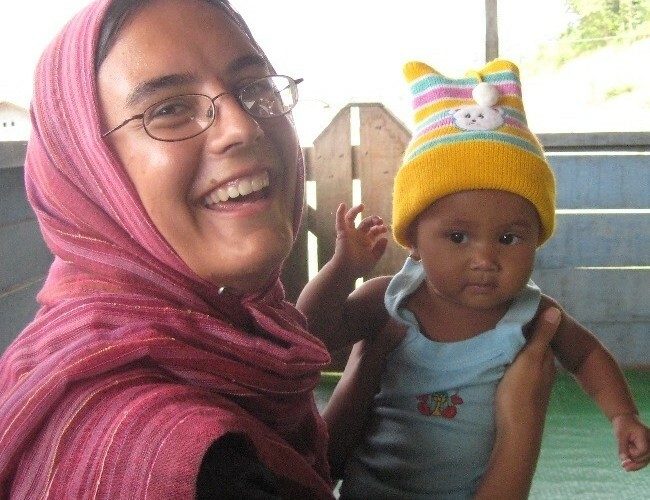 I spent a very interesting ten months, from August 2007 to June 2008, based in Aceh’s main city, Banda Aceh, working on the American Red Cross Tsunami Recovery Programme. My team was responsible for the design of permanent water supply systems for approximately 46 rural communities. My role as a hydrogeologist involved assessing the limited geological, hydrogeological and hydrochemical data and using this alongside information gathered from site visits to determine the water source most likely to provide a sustainable water supply for each community. I worked alongside engineers and social specialists from many different organisations and nationalities, ensuring that the communities played a major role in every step of the process so that the end result was something for which they would take ownership in the future. This process revealed some interesting challenges. The infrastructure was in a state of disrepair as a result of years of neglect during the conflict followed by the tsunami taking most of what remained, and the land on which it stood. The west coast of Aceh also had the forces of tectonics to contend with. The primary earthquakes and aftershocks resulted in approximately one metre of subsidence and the loss of large areas of coastal land to swamp, leaving some communities with nothing, not even the land they used to own. The rapid turnover of staff and organisations created communication difficulties which led to situations such as one community losing their water supply because miscommunication resulted in the new road destroying their spring. Finding a new source involved site visits to areas which required four hours in a 4×4 vehicle on partially asphalted roads and rickety ferries, continuous checking for leeches and fighting off dengue-fever and malaria bearing mosquitos. On a couple of visits we received messages from villagers saying that we couldn’t go into the jungle because a family of tigers had just moved into the area and that we should be careful because an elephant slipped there last month. Not my usual everyday challenges! Working in tropical heat and humidity with very little air conditioning, spending most of my time working on my own with Indonesian Muslim men and not having much of a life outside of work created personal challenges for me. However, this was an amazing experience and gave me the opportunity to apply and develop my skills as a hydrogeologist in a completely new situation. I loved being immersed in a new culture and even taught myself quite a bit of Indonesian and Acehnese, which made life much more entertaining for all concerned! Since returning to England, my skills have been deployed by Mott MacDonald in various different contexts. I spent about 18 months working as the hydrogeologist for Norfolk County Council’s closed landfill team, ensuring that the landfill sites are not contributing to groundwater contamination, and also worked for water companies looking at the impact of public water supply abstractions on surface water flows in nature reserves around Cambridge. I was awarded the title of Chartered Institute of Water and Environmental Management (CIWEM) Young Member of the Year 2009 and Highly Commended British Expertise International Young Consultant of the Year 2009 for my work in Aceh. Elizabeth was interviewed in 2010 for the Alumni magazine.